Samoa I Sisifo is a tiny, independent state in the South Pacific, known to most people as Western Samoa ("I Sisifo" means "Western"). Despite Robert Louis Stevenson, who lived there, Gary Cooper, who came to make films, and James Michener, who wrote Tales of the South Pacific, very little is generally known about Western Samoa. Government publicity for its new tourist drive can justifiably claim that the beauty, charm, and utter originality of these delightful islands is "the best-kept secret" in the Pacific. Everyone knows about Hawaii, Tahiti, and Fiji, but Samoa... The island chain lies west-to-east between 173° west longitude and 171° east; it is between 13° and 15° south of the Equator. 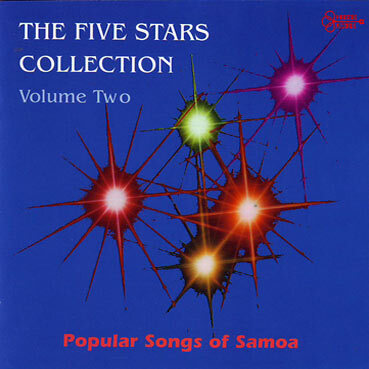 Towards the end of the last century, when the Pacific was being divided between Britain, France, Germany, and America, Samoa was the focus of attention. Rival western powers backed rival Samoan chiefs in bitter fighting for control until, in a final settlement, Germany annexed the islands of Upolu, Savaii and their minor atolls, while to the east, the island of Tutuila, with its wonderful natural harbour, became an American possession. When, during the first world war, German Samoa was taken over by New Zealand troops, it became Western Samoa and this title, "Samoa I Sisifo", was retained during the changeover to an independent state in 1962. Considering the amount of European influence over the past hundred years, Samoa shows little outward sign of change. The ride into Apia, the capital, from the airport at Faleolo is still one of the highlights of the South Paficic. The bus bumps along the road, but that first time you never notice the road or the bumps, because of the wide lagoons, tinted with greens, blues, and purples, which lie on one side, and the villages on the other. Each village has its neatly-trimmed green, and round it stand the fale their sides open to the cooling sea-breeze. People in lavalava (cloth wrap-around) go about their business. Cocoa beans dry on mats in the hot sun; women sit in the shade, weaving; others wash clothes by the stream; the bus may go past a husky Samoan shouldering more that a hundred pounds of taro. Here ripe coconuts are being dried, and round the next corner a group of school-children may have knocked down green drinking nuts for an afternoon refresher. Among all this stand the tiny stores, and in contrast, the huge limestone block churches, the pride of every village. 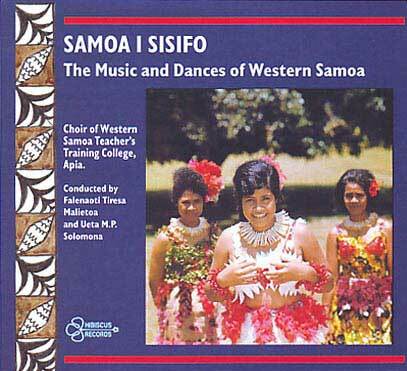 It seems logical that a nation so devoted to this way of life should have developed a rich repertoire of songs and dances, and quite understandable that these should be performed best by the Western Samoa Teachers Training College in Apia. The songs on this recording were sung by a combined choir of two hundred students, consisting of voices divided into four and sometimes five parts. By comparison with some island music, there is an extraordinary discipline and precision in the singing. 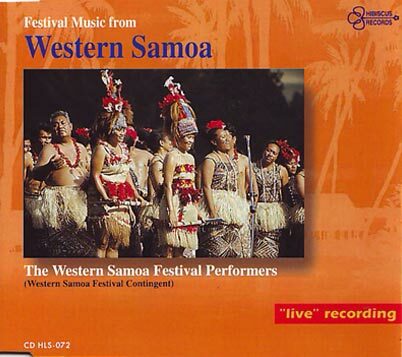 Much of the credit for this must go to the Principal of the College, Mrs Falenaoti Tiresa Malietoa, who herself conducted a large number of the items during the recording session. 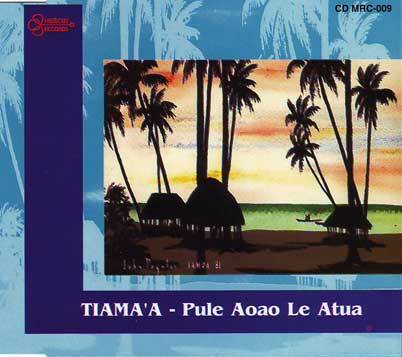 Part of the repertoire is traditional, with such songs as "Malie e, Tagifa," "Tausani Mai Manu e", and those in the "Siva" bracket, which conjure up visions of a resplendent Taupou (village queen) leading the people onto the malee (village common) during ceremonial occasions. She wears a headdress of bleached hair, bright mirrors faced with red parrot feathers; her dress of tapa is also gaily decorated, while her neck, shoulders, arms, and legs gleam with coconut oil. The Siva is a dance peculiar to the Samoan islands. Notice that there is no instrumental accompaniment, only a light drum on rolled matting, and in some songs, clapping of the hands.